I turned the corner on my way to a breakfast meeting and discovered this amazing door. I loved the rich purple and the gold of this art deco door in Seattle. Originally the doors were to a theatre but they now open up to an evening restaurant. I wanted to imagine Flappers coming out of the doors, beads dangling on both dresses and necklaces…but I can’t quite tell if this door is actually that old. 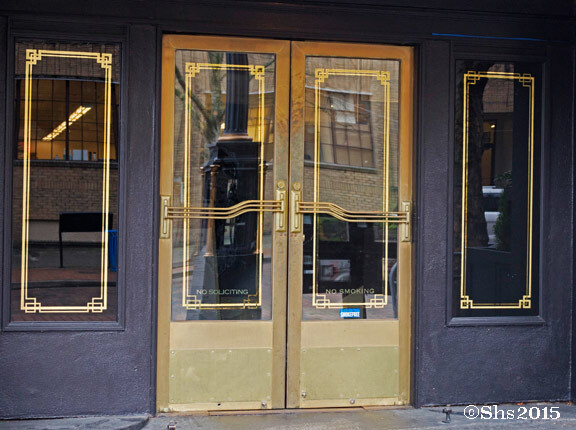 Gallery | This entry was posted in Doors and tagged Architecture, Art Deco, breakfast meeting, Doors, entranceways, Pioneer Square, Seattle, theatre, Travel photography, World Doors. Bookmark the permalink. But WHEREEEEE, I want to know WHEREEEE……is this the Triple Door at 2016 Union? This one fooled me! Originally a drugstore and now a steak place. Occidental and Jackson. Thank you for saving me from going nuts. I will go look at Occidental & Jackson ASAP. The building used to be a drug store then a retail shop and various others till now a steak place. I thought the doors looked so theatrical but now I see they could be drugstore doors!!! I love how things aren’t always what one imagines!